The Integrative and Functional Nutrition Academy™ (IFNA™) training program is based on a medical nutrition model that combines the very best of modern science, clinical wisdom and integrative therapies. Increasing consumer demand, advancing technology and the changing healthcare landscape are driving the demand for clinicians trained in integrative and functional nutrition (IFN). A central theme of IFNA™ training is learning to identify “root causes” of disease in a methodical and systematic fashion rather than the mundane prescription of medical nutrition protocols based on a diagnosis. This requires a deep understanding of function, not just pathology; networks of physiology, not just “silo” organ systems and an organized, integrated nutrition assessment. The IFNA™ trained clinician is able to critically assess a patient using a “whole systems” approach and personalize a holistic nutrition care plan to restore function and improve outcome. The Integrative and Functional Nutrition Academy™ (IFNA™) is a clinically oriented online training and mentoring program founded by two of the nation’s premier integrative medicine nutritionists, Dr. Sheila Dean and Kathie Swift. IFNA’s distinguished faculty and advisory board includes top leaders in integrative and functional medicine– trained allopathic and naturopathic physicians, registered dietitian/nutritionists, nurse practitioners, culinary nutrition experts, holistic health counselors and other allied professionals. Successful completion of the IFNA functional nutrition training program and board exam leads to the Integrative and Functional Nutrition Certified Practioner (IFNCP™) Advanced Practice Credential. 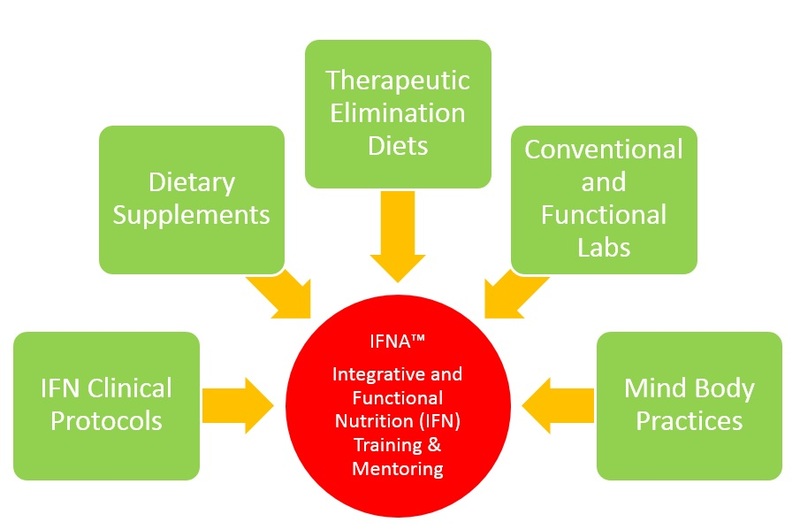 IFNA™ training includes skill-building and competencies in key clinical areas: nutrition-focused physical assessment; therapeutic elimination diets; conventional and functional labs and diagnostics including nutrigenetic testing; art and science of dietary supplements; mind-body modalities such as meditation, yoga, breathing techniques and other lifestyle-oriented practices. A “whole food as medicine” approach is central to IFN therapy, thus an understanding and application of culinary nutrition concepts, condition-specific healing foods and bioactive compounds in the “food farmacy” is also included. At the Integrative and Functional Nutrition Academy™, you will acquire the knowledge, skills and tools in IFN therapy that will bring you greater satisfaction in your professional practice and those you serve. IFNA™ training also distinguishes you from your peers to make you one of the most sought after clinicians in the competitive healthcare marketplace.